Stash, a mobile application that aims to make investing easier for those who aren’t as financially experienced, has raised $25 million in Series B funding, the company announced today. The round, which follows the startup’s $9.25 million Series A just this August, was led by prior investor Valar Ventures, with participation from Breyer Capital, Goodwater Capital, and Entrée Capital. The micro-investing app is now one of several that target a largely millennial audience who wants to try their hand at stocks, without taking on as much risk. It competes with others in this space, like Acorn and Robinhood, the latter which has pulled in $66 million from investors like NEA, Index Ventures, Andreessen Horowitz, and others. Like its rivals, Stash doesn’t charge commissions on buying and selling investments or transferring money in and out of its accounts. However, it still charges a fee of $1 per month for accounts under $5,000, and 0.25% per year for those with balances over $5,000. The need for ongoing fees makes Stash somewhat less radical than Robinhood, which generates revenue from interest on uninvested cash and margin accounts, a newer offering within its premium product Robinhood Gold. Despite their differences, Stash, Acorn and Robinhood are all after the same sort of audience – those who have been overlooked by traditional investment management industry, which focuses more on assets under management. “Our aim at Stash is to make our platform available to as many people as possible, regardless of their net worth. We are targeting an undervalued demographic who can, and should, only give small amounts at a time,” explains Stash CEO Brandon Krieg, who co-founded the company with fellow Wall St. veteran Ed Robinson. “We recommend growing assets over a long period of time, and using investment products that reflect an individual’s risk tolerance, financial goals, beliefs, and interests. Many investment managers with billions of dollars in [assets under management] care more about attracting assets and earning sales commissions and fees than they do about putting the long term financial health of their clients first, which can be a clear conflict of interest,” he adds. Stash offers a different type of investing solution, and that’s been paying off so far. The app is now adding over 10,000 users per week, the company claims. And it added more than 300,000 customers total in a year’s time. While some micro-investing tools do the work for you, Stash lets its users build their own portfolio by suggesting investments that match up with their own beliefs, goals and tolerance for risk. Investors choose from a selection of over 30 ETFs selected by Stash’s team. Investments are chosen based on a model driven by factors including historical performance, expense (fee) ratio, risk profile and asset allocation. Along the way, Stash also tries to educate customers on investment basics, by offering guidance and tips. To date, Stash customers have invested over $25 million via the app and that number is growing. 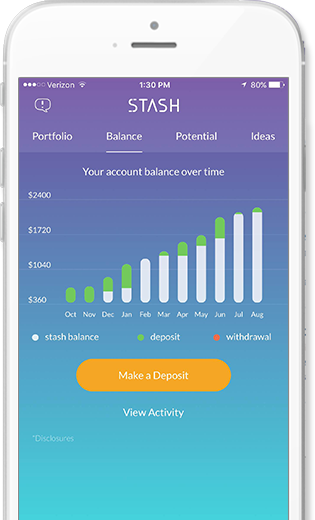 While Stash’s business and others may work out well for the platform owners, they’re not necessarily helping customers with their larger financial goals they way traditional investments can. These apps may help get people comfortable with stock market concepts, of course. But they only require a few dollars to start, then they charge monthly fees. Unless you start making larger deposits, you’re not really investing – you’re just playing around.